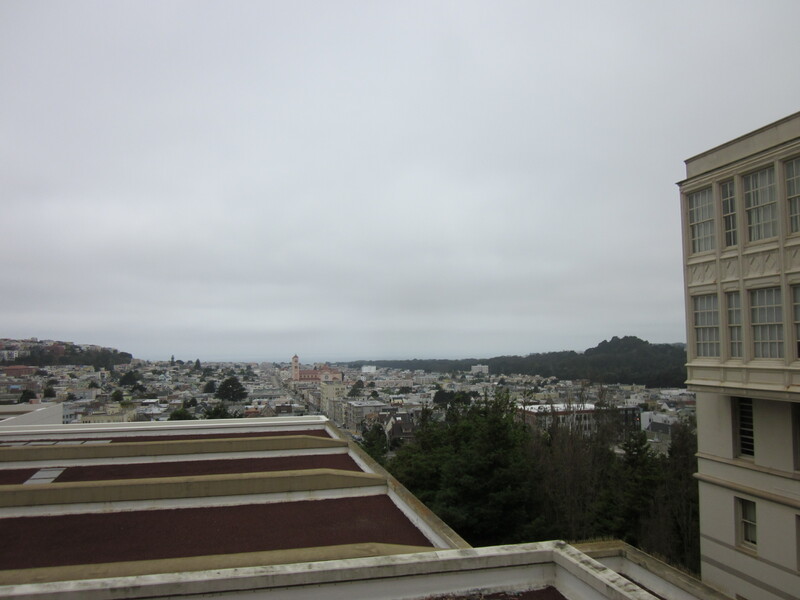 We looked out over San Francisco from the first flight of stairs to Mt. Sutro. This landing is about 200 horizontal feet east of and 12 stories above our front door. Although we love our bikes, we still think of ourselves as pedestrians a lot of the time. This is sort of nice, because riding a bike is so much faster than walking that I always think I’m getting away with murder when I arrive more quickly than I could have on foot. It’s also useful in other circumstances. The other week, we needed to head to the other side of Mt. Sutro when the main road was under construction. So we hoofed it through the cloud forest. 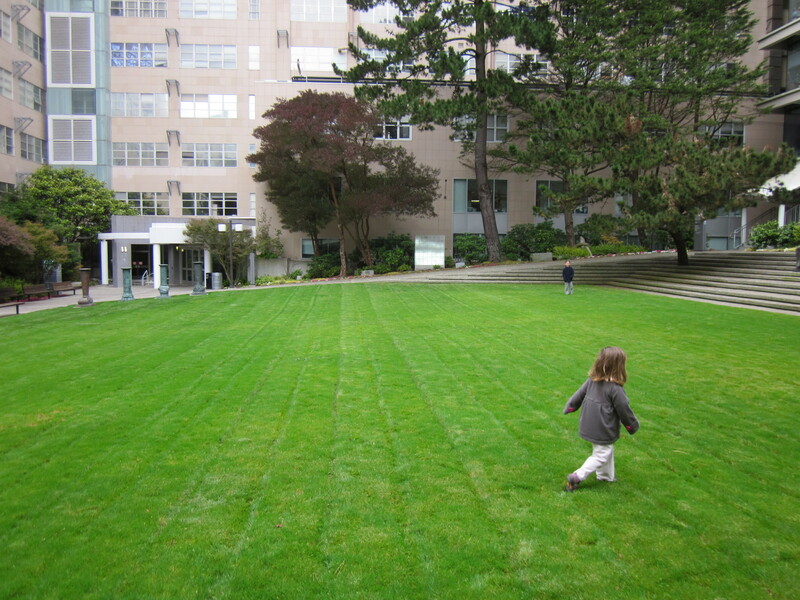 The largest courtyard on campus–my son’s preschool graduation was held here. Our route over Mt. 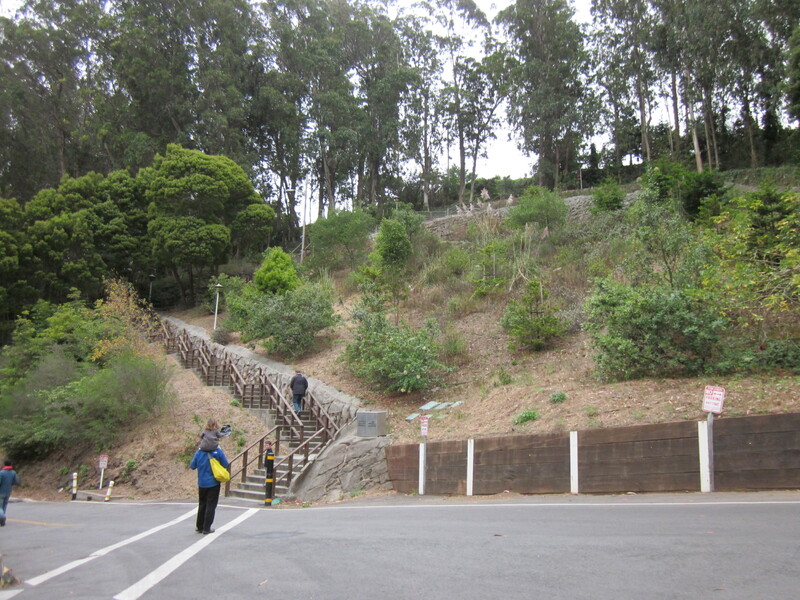 Sutro goes through campus on a path that’s closed on weekends to people who lack an access card. In the back of the hospital and clinic buildings are a series of courtyards where the university flattened out a bit of turf here and there. It makes for nice views from the building and gives the kids a chance to run around. From the main courtyard we head into the forest. 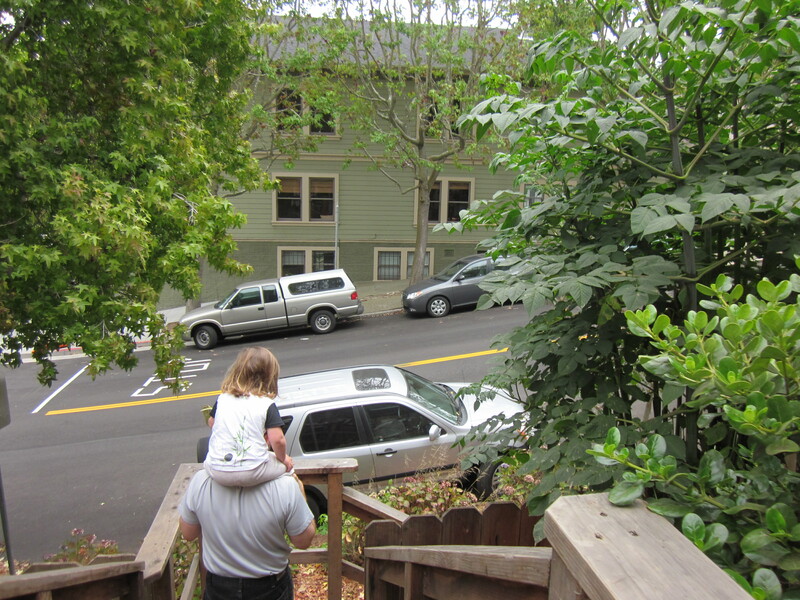 The stairs up the hill are why we will never ride our bikes up there. There are people who ride mountain bikes in the cloud forest, but they have to carry them up the stairs. That’s never going to happen with our cargo bikes. Our daughter didn’t have the stamina to make it up on her own, so Matt carried her for most of the way. It turned out that there were volunteers and city workers out on the trail clearing poison oak so it’s probably just as well she wasn’t walking. We did actually meet a mountain biker while we were there. He had stopped to let us pass as we came close. I asked if he wanted to get by, and he panted, that no, he was happy to get the rest. I know how that goes. He had carried his bike up the shorter flight of stairs on the other side of the mountain but it’s still a slog. We came down the the other side and headed to the fire station to play on the trucks, then to the bakery and the hardware store. Our son was too tired to go back up and down the mountain, so on the way back we ended up walking along the closed road that the city was repaving. It’s a shorter walk but was decidedly less pleasant. This is San Francisco too. It’s such a haul up the hills that we don’t go up Mt. 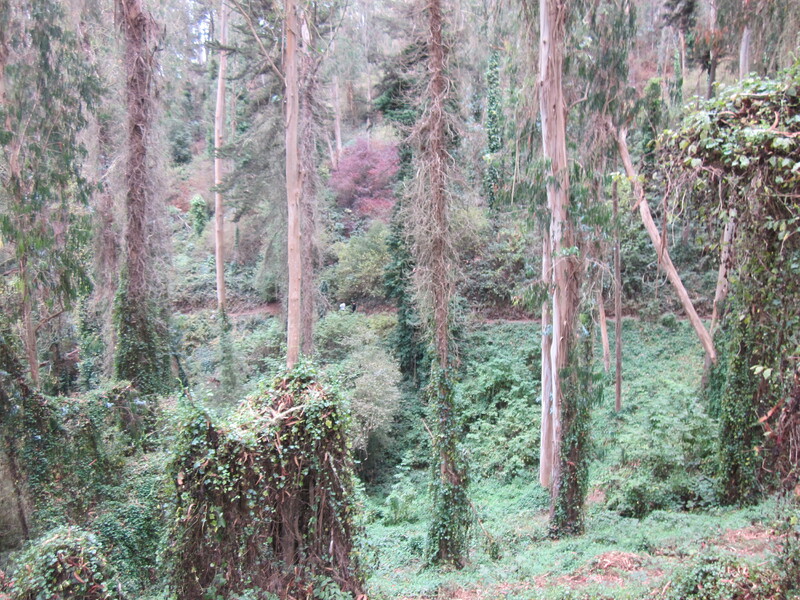 Sutro often, but it always amazes me that there is such a place less than a couple of blocks from where we live. Admittedly those two blocks are almost completely vertical. 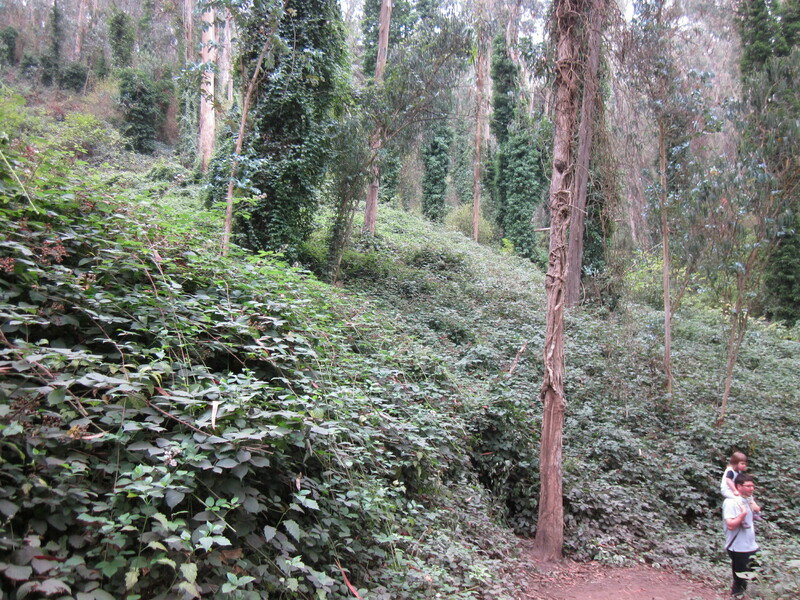 But San Francisco is so densely populated that it is unnervingly wonderful to walk for a few minutes directly into the dead silence of the forest. It is hard to believe in that moment that this is all part of the city. Oh, I know. I’m crippled by the combination of kids who are constantly running ahead to the next thing and a crappy camera. The camera is on its last legs, though–you may have noticed the quality of shots has been devolving in the past couple of months as the shutter speed slows. It would barely take pictures at all at Kidical Mass. Maybe I’ll get a better one for my birthday. Right now I’m hoping any photo is better than none. NEW CAMERAS come out in August. I’d suggest a camera that’s easy to carry in your pocket or purse & has a long zoome, good quality, etc. the new Nikon Coolpix P7700 & Canon PowerShot G15 cost approx. $500 the Big Difference (if you think about it) is Canon has a regualr viewfinder in addition to the LCD screen; the Nikon LCD screen is articulated, so you can spin it around to take pics of yourself or family together…but a regular viewfinder is good if you often find sunlight washing out your LCD display and can’t see. The new Canon PowerShot S110 is even more/most compact and also has Wi-Fi and GPS, so you could GPS tag your photos (and it seems you travel al lot) and WiFi transfer them. I like the reviews, info and samples given at: http://www.dpreview.com/ — Once you get the camera, the pictures are cheap and like bikes, they are great conversation starters, a nice group of people, and fun. Plus you get to tell people to ‘smile,’ — ‘move a bit to the left,’ etc. (just snap the pic quick). Thanks for the suggestions. I had heard good things about the Powershot S95, but it seems there are few steps up from there. Unfortunately I drop the camera a lot; it hasn’t done it any favors, and it’s made it hard to justify spending money on a new one. However the fact that the camera won’t turn on half the time anymore is an issue. Oh…you ‘drop’ the camera a lot…Like many who earned a living (for awhile) with cameras we take that serious; As we say: that’s a ‘no-no.’ So A) We use the camera strap…religiously (now for compact models there are things like a ‘wrist pod’ http://www.goldenhourcompany.com/product.htm) B) Have the cameras on an insurance policy (All State will do it with tenant’s insurance, others too). or, C) Get a compact camera that boasts of how waterproof and dustproof it is…or actually provides estimates of how far it can be dropped. Just as a non-recommended example, the 2011 Panasonic FT3 boasts it’s a rugged compact: dustproof, waterproof up to depths of 12m (40 feet), shockproof against a drop of up to 2 meters (6.6 ft), and freezeproof down to -10 degrees C (14F). With GPS, a Barometer, Compass and Altimeter (!) Obviously intended for camping or the beach,All for $approx $325. but with somewhat mediocre reviews of it’s photo quality. — I dropped my iPhone once. I was glad it was in a shock proof case. Note that there are several entrances to the park that don’t require carrying a bike up the stairs. — Ride up Medical Center way to the Historic Trail. — enter on Johnstone off of Clareden. The best entrance, in my opinion, is at Stanyan & 17th, which is easy to get to and requires carrying the bike up about 20 stairs total. Good to know. I think we’ll take streets on our heavy bikes nonetheless… If I ever get a mountain bike I’ll go up Medical Center Way, though.